The Time is Night to Hasten Doom! 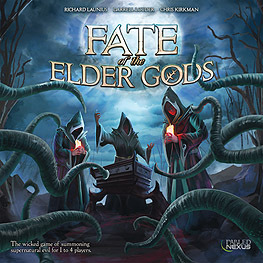 Each cult is competing to be first to summon their god, but they must also repel intrepid investigators working to seal off the gate to beyond with Elder Signs. Gather arcane artifacts, cast powerful spells, embrace the Dark Gift of your Elder God, and be first to awaken your dread master... before it's too late!